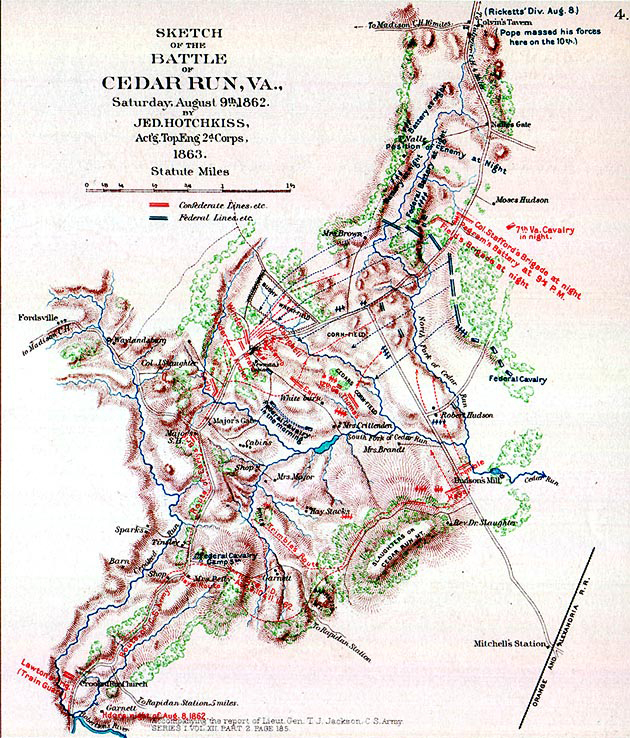 The Battle of Cedar Mountain took place on Saturday, August 9, 1862, and featured the highest amount of casualties of any battle in Culpeper, Virginia. It is known as the only battle in which famed Confederate general Thomas “Stonewall” Jackson pulled his sword to rally his troops. 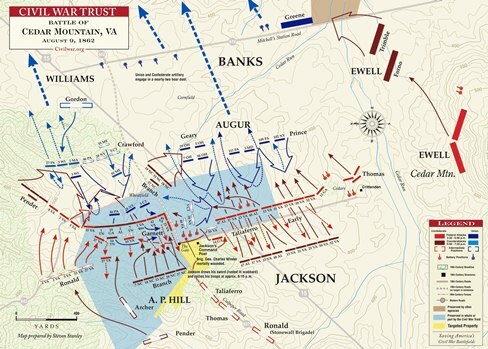 It was an extremely hot day, reported to be 84 degrees at 8 a.m., 98 degrees at 3 p.m. and 86 degrees at 9 p.m.
Confederate forces under General Stonewall Jackson moved towards the isolated Union troops under the command of Major General Nathaniel P. Banks with plans to attack, Banks maneuvered his 8,000-12,000 man II Corps to contest the advance. Jackson with 20,000 plus troops encountered Bank’s pickets at noon just north of Cedar Mountain. Banks’ made repeated assaults on Jacksons troops but was repulsed; a surprise attack by Brigadier General Samuel Crawford’s Brigade drove back the Confederate left flank. Crawford’s troops charged through a wheatfield and smashed into Confederate regiments of the “Stonewall Brigade”. Confederate Brigadier General Charles Winder was killed by an artillery shell while leading his division. As Crawford’s advance gains momentum, the Confederate line began to break and a rout seems imminent. Arriving on the scene, Stonewall Jackson attempted to rally his former command by drawing his sword. Finding that it had rusted in the scabbard from lack of use, he instead waved both. With Jackson rallying his troops and the timely arrival of A.P. Hill’s Division turned the tide for the Confederates. Hill’s counterattack smashed into Crawford’s advanced position, wreaking havoc among the Union regiments. The 3rd Wisconsin and 46th Pennsylvania bore the worst of it, but the 28th New York and 5th Connecticut also suffered heavy losses. Seeing that the 46th Pennsylvania was about to lose its colors, Major George Gile broke from the ranks and with a few volunteers from the 88th following him, rushed to retrieve the 46th’s flags. He returned to the 88th with the Colors from the 46th, where they remained briefly for safe keeping. By 6 p.m., the worst part of the battle was over. Union troops of the Second Division of McDowell’s III Corps move to reinforce Banks’ II Corps, but arrived too late in the day to be a decisive factor. Ricketts’ Division marched westward down the Culpepper-Orange Road from their reserve positions. Ricketts moved to the right flank to shore up Crawford’s decimated units. Later in the evening after the fiercest part of the battle is over, they were ordered to advance. Having drawn rations and carrying sixty rounds of ammunition, Tower’s Brigade is posted to the Union right flank. Moving under cover of dusk, the 88th turns right off of the Culpepper-Orange Road and moves up a small farm lane (now called Dove Road) adjacent to a creek bed. A regimental band from Carroll’s Brigade strikes up a tune for the passing troops, and in so doing, inadvertently alerts nearby Confederates of the arrival of the reinforcements. Passing the devastated ranks of the 46th Pennsylvania, the 88th comes under artillery and rifle fire at dusk. Under the shroud of darkness, the fire is only marginally accurate and the regiment suffers only one wounded. Private George Teed, of Company B, who became the first soldier of the 88th to be wounded in action as a piece of shrapnel tore into his leg. The troops spent the night under arms and in anticipation of the coming morning’s battle. Above them, Hall’s 2d Maine Artillery continued its nocturnal dual with opposing Confederate artillery crews. 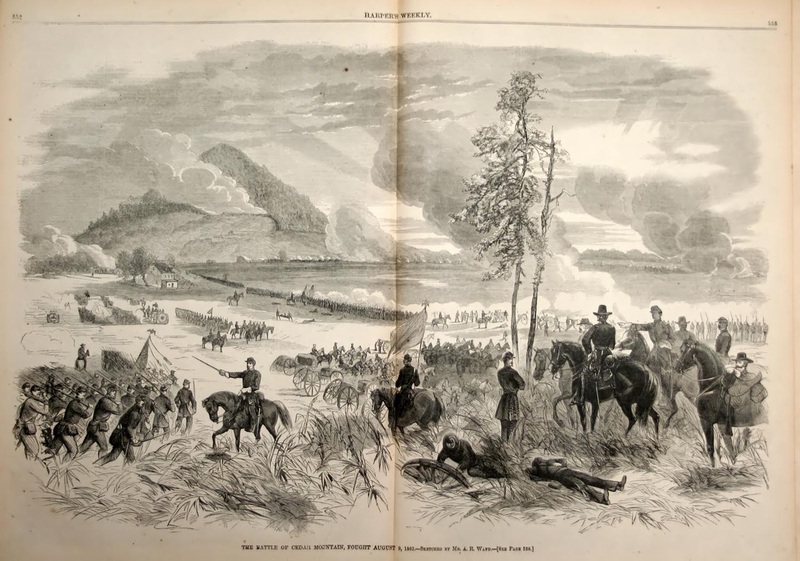 Sunday, August 10, 1862 During the night, not wishing to be counterattacked by Union general John Pope's entire force, Confederate general Thomas J. "Stonewall" Jackson withdraws his troops from Cedar Mountain to await additional reinforcements from Robert E. Lee. Ricketts’ Second Division remained posted on battlefield, covering the Union right flank. Tower’s Second Brigade was detailed to move down Madison Road to meet a reported Confederate advance. Tower pushed out approximately three miles but finds no large Confederate units. The brigade was engaged in light skirmishing only. Major Gile commanded the Federal picket line, and while probing the Confederate positions, was first to discover the Confederates’ withdraw. The fire was nasty artillery, our position was so close to the Rebels Artillery that the gunners were plainly seen moving at their guns. I called the Colonels attention to the fact that the thundering Scamps were moving through a woods to flank us on the right, he communicated it to the General, the Genl gave the orders to move to the right, we hardly executed the order before they opened on us or at us with a full battery: From that very woods. But our Sudden move spoiled all their fun, They hadn’t got the range of us. All the balls and Shells past over us but one that exploded so near us as to take the calf off one of my men. Few of our men were wounded on account of the Darkness which began to settle over the Field. We slept all night on our arms. Was in line all of yesterday, nothing but slight skermishing all the Day. we have from about 8 (00) to 1000 killed and wounded, the enemy have lost very heavy. I am unable to find out. They were driven back, and I am now writing this in the old position. Jackson said he would be in Culpepper tonight but I can’t see it. Lizzie don’t put any faith in reports of my death till you hear it from an officer of our Regt. But I don’t think it will come to this. So good bye till I write again. Source: Joseph McLean to Wife, 11 August 1862, transcript in the hand of LTC McLean, courtesy of Mrs. Bonnie McLean-Yuhas. as told in The Campfire Chronicles, The Words and Deeds of the 88th Pennslvania by Major Michael N Ayoub. Union losses were 320 killed, 1,466 wounded, and 617 missing totaling, 2403 out of 12,000 troops engaged . The Eighty-Eighth suffered only one wounded. Confederate casualties 314 killed, 1,062 wounded, and 42 missing totaling 1418 out of 20,000 plus troop engaged. 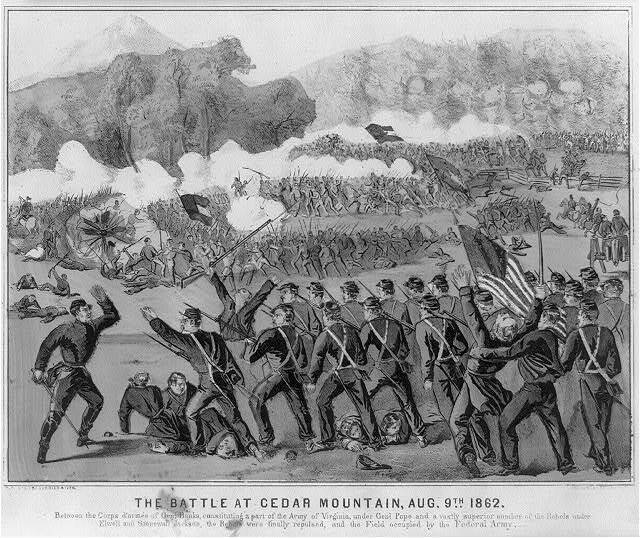 Friends of the Cedar Mountain Battlefield, Inc.